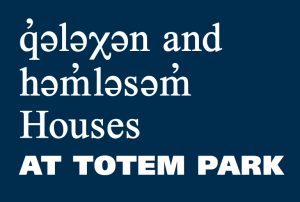 The həm̓ləsəm̓ and q̓ələχən at Totem Park Residence are the first buildings on campus to carry names in hən̓q̓əmin̓əm̓, the language of the Musqueam people. This collaborative naming process was led by Spencer Lindsay and Sarah Ling, alumni of the First Nations and Indigenous Studies Program in 2011. Lindsay and Ling met through the summer FNEL 480 course on Endangered Language Documentation and Revitalization. During the following academic year subsequent to this course, they decided to apply the skills and knowledge they were acquiring to create positive change on campus. This resulted in the creation of Decolonizing Knowledge, initiatives to address issues of misrepresentation and appropriation at Totem Park Residence, and the Totem Park Residence Infill Building Names Advisory Committee. For news and updates, follow the Decolonizing Knowledge Facebook page.